Everyone goes through grief. Some people may not have experienced it yet, but part of loving someone is learning to continue on if they unfortunately pass. Lost Words: Beyond the Page, from publisher Modus Games, attempts to create something tangible about that feeling of grief, telling a tale of a young girl who loses the person she looks up to most. That girl is Izzy, and Lost Words takes place in two different representations of her mind. 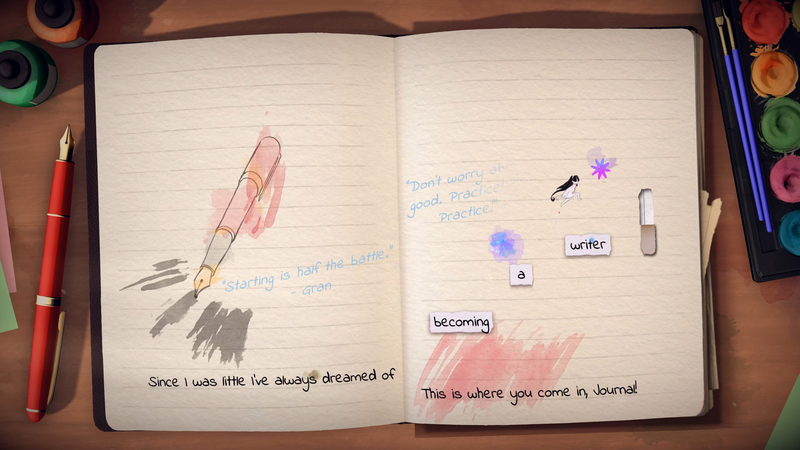 Roughly half of the game is set in the Izzy’s diary, the rest takes place in a representation of the fictional world Izzy creates. Both offer their own unique gameplay mechanics, but they also both work together to tell an emotional, human story. The beginning of my Lost Worlds preview, like the beginning of each chapter, takes place in the pages of Izzy’s diary. A budding writer, the pages are filled with her thoughts, her constant back-and-forth. In fact, the words on the page itself are the platformers in this section of the game, meaning her words are literally how she progresses. The platforms appear as Izzy writes (and narrates) her innermost thoughts. In a nice little touch, certain words contain asterisks, and by engaging with them you can unlock more information, giving greater context to this world. You’re doing more than simply running and jumping, however. While the developers didn’t exactly describe Lost Worlds as a puzzle game, there are some slight puzzle elements here. Certain words can be used for more than platforms, they can affect the world around you. For example, using the word “unlock” will open a locked gate, while using “blow” on a group of candles will extinguish them. It’s certainly an intuitive idea, and actually does a lot to keep the player even more engaged. You can even make small decisions as you journey, choosing things like the color of the outfit Izzy’s main protagonist wears. These decisions may not be game-changing, but they allow the player to make an emotional experience a little more personal. These diary sections are meant to be more experiential, letting you learn more about Izzy’s life and her mindset at the time. It’s a more intimate experience, and the (fully orchestrated) score reflects that. It’s a smaller, more personal musical accompaniment, allowing you to fully invest in this narrative. 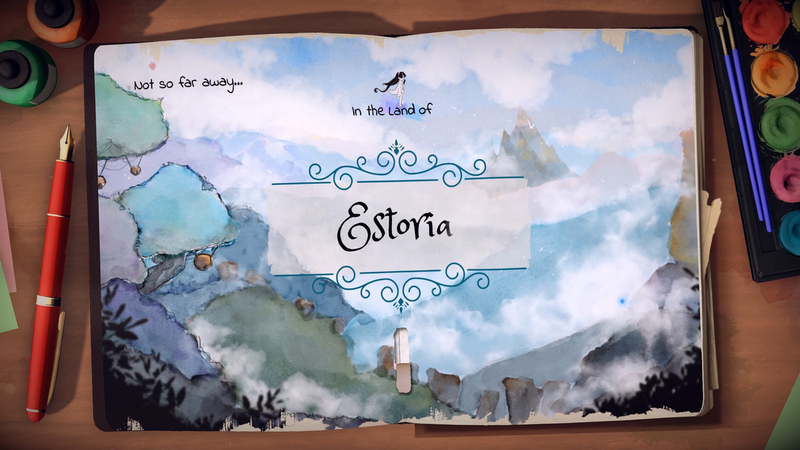 Where the diary is more personal experience, the other half of Lost Words takes you to the fantasy world of Estoria, the setting of the story Izzy is creating. The world of Estoria has contains a beautiful watercolor aesthetic. And fitting to the grand fantasy adventure, the score is much more majestic while in Estoria. The side-scrolling platforming remains, but there’s more of a focus on exploration and taking in the environment. As such, while the two sections constitute roughly half of the game, the developers still expect more time to be spent in this world. While you may no longer be in the diary, you are still in the words of a book, as such, you are still able to use words to manipulate the environment. Instead of encountering specific words while you explore, while in Estoria you actually have a word book. This lets you store magic words to use throughout your journey. In the preview, we only got one, “rise.” Naturally, using it will raise all sorts of objects in the environment. If you can’t quite reach that platform above you, why not look into your word book? Knowledge is power, as they say. While the fantasy world isn’t an exact replication of Izzy’s life, the circumstances she faces certainly are represented in her words. As with any good fantasy tale, the journey starts off hopeful, optimistic, and full of excitement. However, as she deals with the loss of her grandmother (who’s represented in her story as a wise leader) and deals with her grief, it’s reflected in her story. The main theme of Lost Words is grief, and how to deal with a loss we must unfortunately all face in some form. However, the team at Sketchbook Games did not want this to be a grim affair. Grief is only part of loving someone, after all, and as such, the team wanted to deal with a heavy topic in a positive light. It’s always tough losing loved ones, but we all learn how to live with that grief and use it to keep pushing on. The team took this so seriously, in fact, that they went to real mental health professionals to ensure that their depiction of grief was an accurate and realistic one. They actually worked with the Wellcome Trust, a renowned company focusing on mental health and psychological issues. And if that name sounds familiar, that’s the same organization Ninja Theory worked on when depicting psychosis in Hellblade: Senua’s Sacrifice. The moment I first laid eyes on Lost Words: Beyond the Page, I was captivated. Heavy topics like grief are still themes that aren’t explored too often in games, and like Gris, which tackled a similar topic, Lost Words attempts to tackle such a serious theme in an unconventional way. For Lost Words, it’s the reflection of the author’s mindset in the works they create. At a short playtime of around three hours, it’s a perfectly digestible experience that gives you a story that’s both heartbreaking and heartwarming. Lost Words: Beyond the Page will release later in 2019 for the PlayStation 4, Xbox One, and PC.